Using mentor sentences is a great way to do a spiral review of grammar and writing skills. 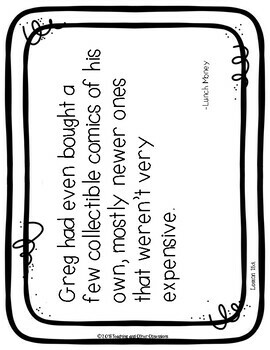 This is a set of 2 mentor sentences for each lesson in unit 4 of the Journeys basal for fifth grade. 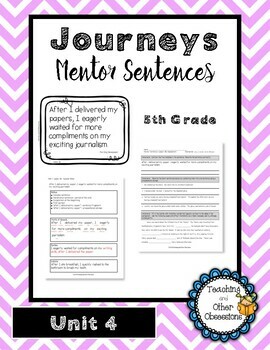 The mentor sentences are in the form of a poster and sentence strips for each student. 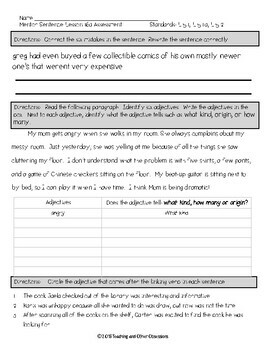 Teachers are provided with a notes page for each mentor sentence lesson which includes a parts of speech answer key and examples of what can be discussed for "noticing" the sentence. 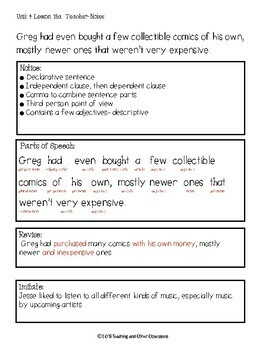 There are also examples of imitation and revision sentences. Assessments are provided for each lesson to cover the mentor sentence, grammar skills for the week (from the Journeys program) and review skills. Answer keys are provided for each assessment. A parent letter is also provided to explain grammar instruction through mentor sentences. Standards are listed for each lesson, as well.